Opening your windows to the morning sun, with the first sun rays casting its shimmery reflection on the ebbing water level of river Ganges; or absorbing the morning serenity seated amidst the greens listening to the chirpings of the birds; or descending the iron steps to have a dip in the Ganges in a more private ghat; or witnessing a twilight silhouetted by the trio temples- Bally Rashbari offers it all, in one heritage homestay. November end was always spectacular for me as it denoted the week-long celebration of Rashyatra, more as Rashmela with those riot of colours filling the grounds of the Rashbari premises of Bally. Not only did it meant the ride of the Ferris-wheel to me, but a visit to the old high-ceilinged rooms of the Rashbari, courtesy my father’s friend living there. The rooms fascinated me even more, with the railed (we say Kori boroga) roofs and the high bed, all echoed sophistication in itself. The younger me was indeed taken by the grandeur of the building. With my growing years, my father’s friend shifted, so did the Mela (fair) to the outer grounds and thus our approach was limited as the public access of the building grounds which consisted of the Nat Mandir in the Centre. 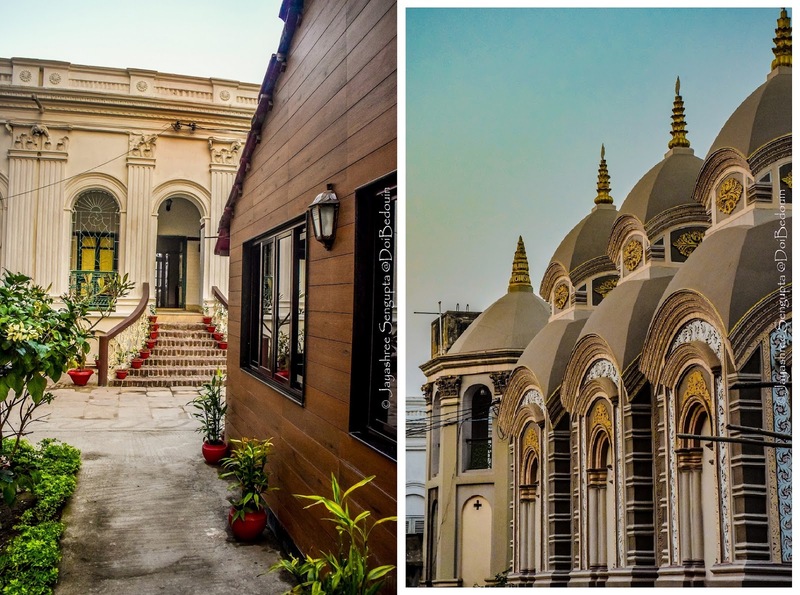 And last Sunday I felt the same enthusiastic me photographing the all-renovated architecture; going down the memory lane and revisiting the past, however with an all new look. 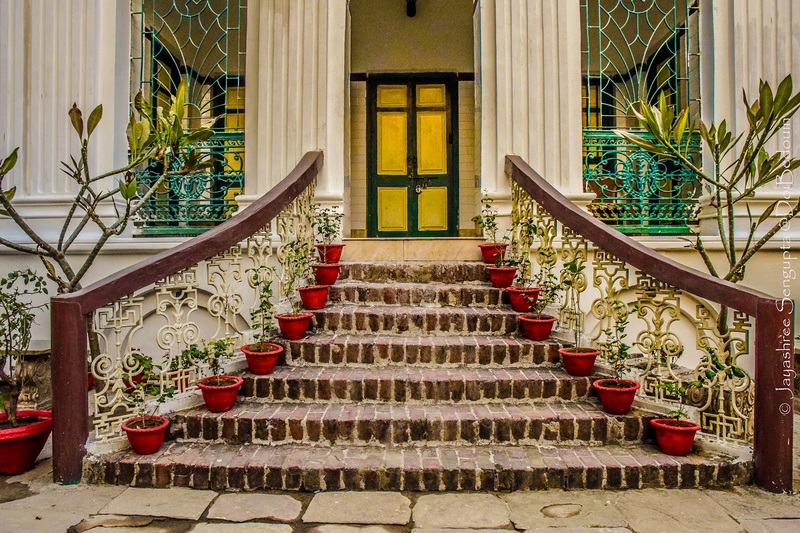 The Bally Rashbari dates back to the 19th century, founded by Shri Purna Chandra Daw. 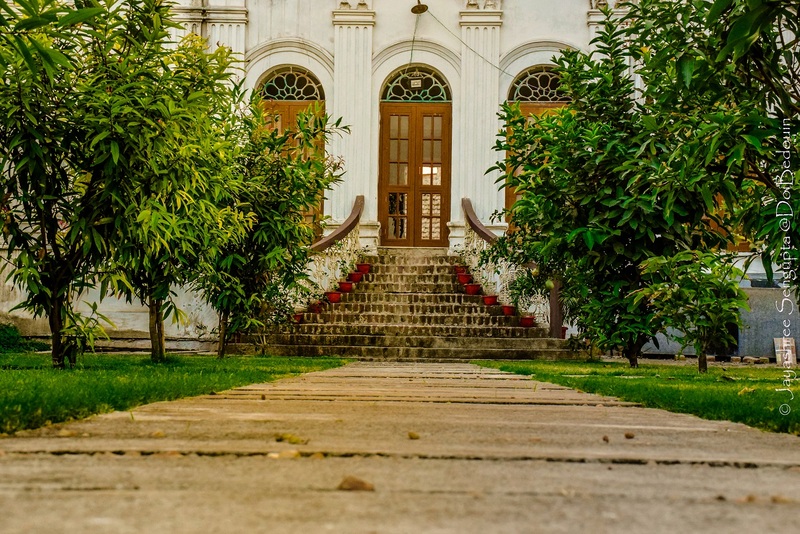 The lineage passed onto Shri Atanu Daw, and it is his conception of remolding this historical place into a heritage homestay. The manor of Sree Sree Radharaman Jiew is now owned by Shib Krishna Debottar Estate, managed and administered by its Sole Shebait & Trustee. 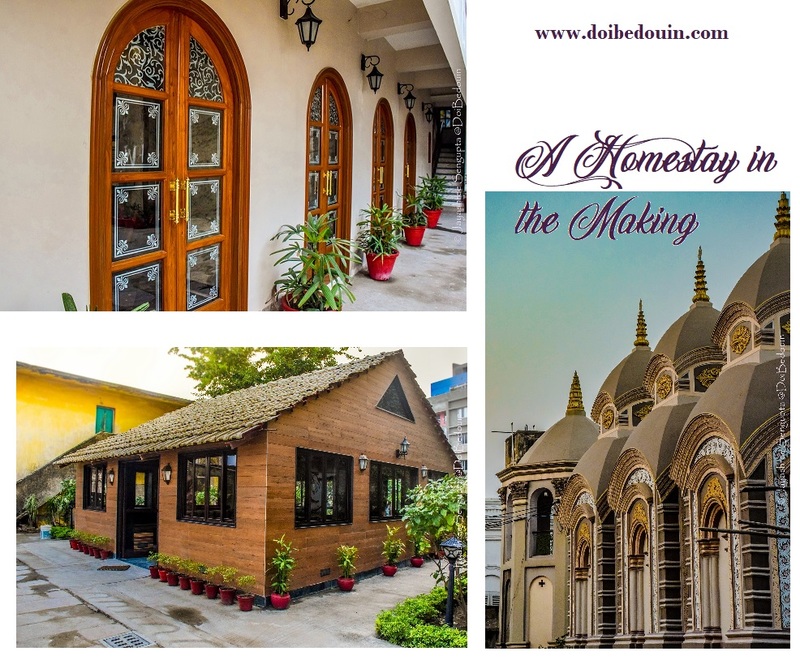 However the senior most member of the Daw family still holds the decision making authority bestowed upon him by the ‘arpannama’; Shri Ashim Chandra Daw, being the senior most, acknowledged his son’s idea in renovating the heritage of the estate. 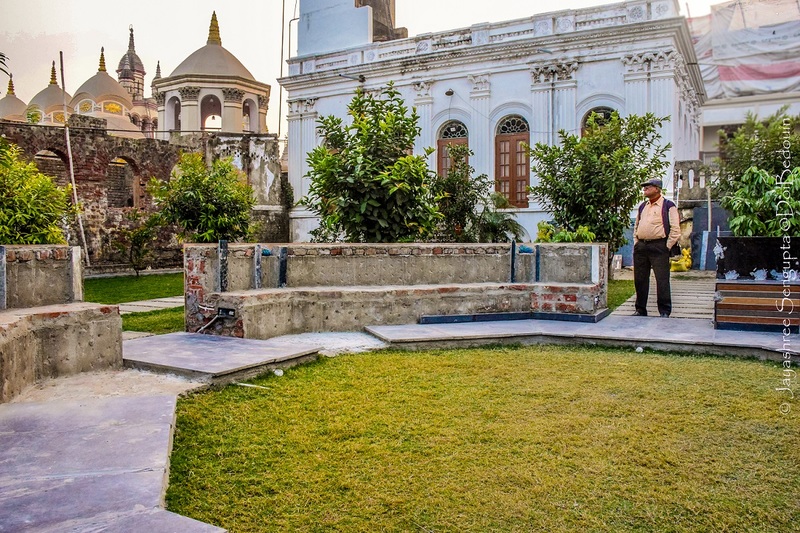 The Rashbari premises has its own garden lawn by the banks of River Ganges; the garden is again set in a triplet before paving for the ghats. 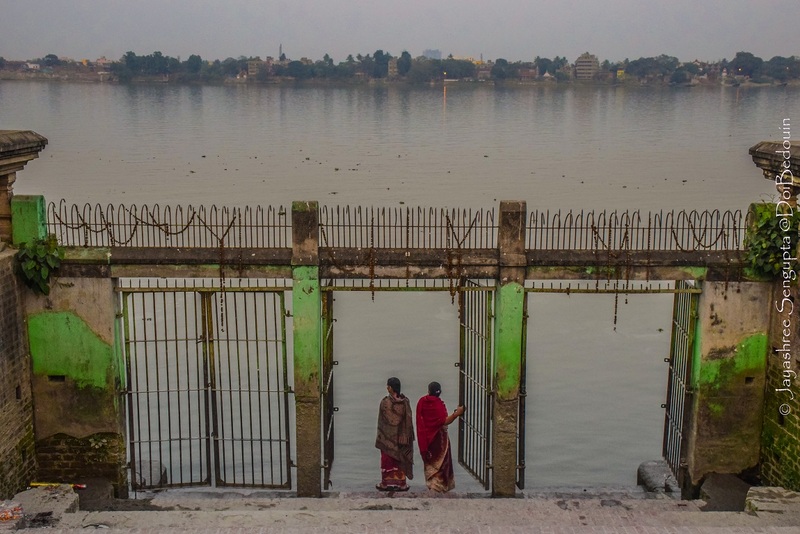 The Rasbari Ghat in the public access area. The walkway from the gates first stops one at the Radharaman Nat Mandir, a typical Nabaratna temple structure, placed centrally in the garden, with a Rasmancha on the left and a Thakur Dalan on its right. Going beyond, these structures are frontlined by a symmetrical system of six Shiva temples, three on each side of the mid-placed Clock tower supported on Corinthian pillars. 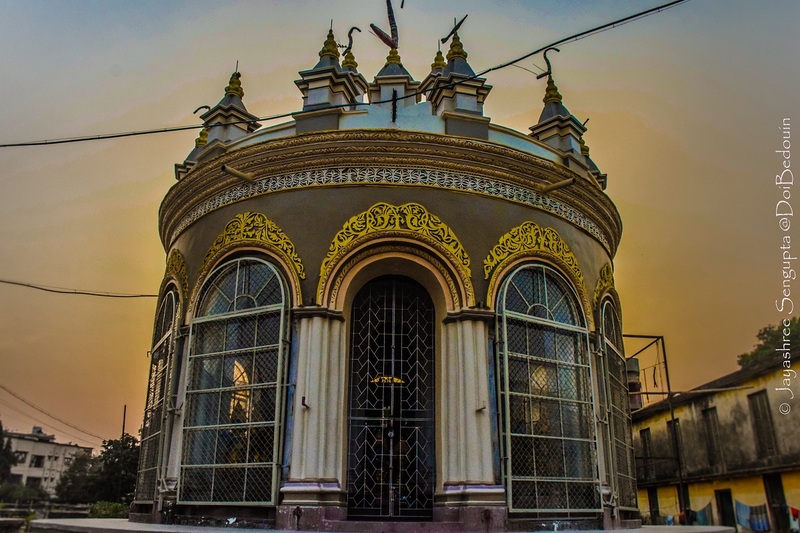 These Shiva shrines are of typical Atchala Bengal Temple Architecture and is renovated with the golden hued designs. This line of structures marks the start of the lawn which is by the river banks. The lawn is skirted by a paved road in the center to the ghat stairs, edged by iron gates at the waterfront. The house is also renovated with a café welcoming you, adjacent to a two storeyed mansion, the same I used to visit as a child. In front of the café an elevated single storeyed structure stands in white and green. It also leads to the backyard by the banks of the river with a renovated seating arrangement in between the trees, a perfect blissful place to have your morning tea. 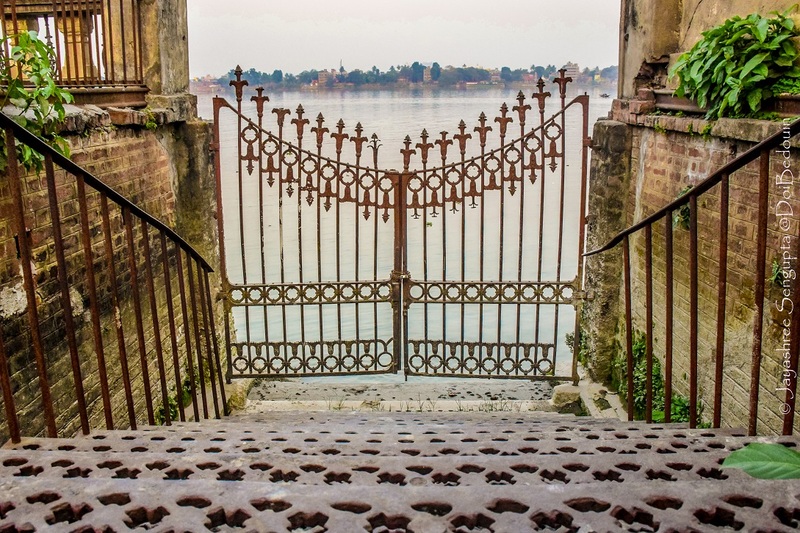 One would also find a gated ghat with iron steps here; a personalized bathing ghat one might say. 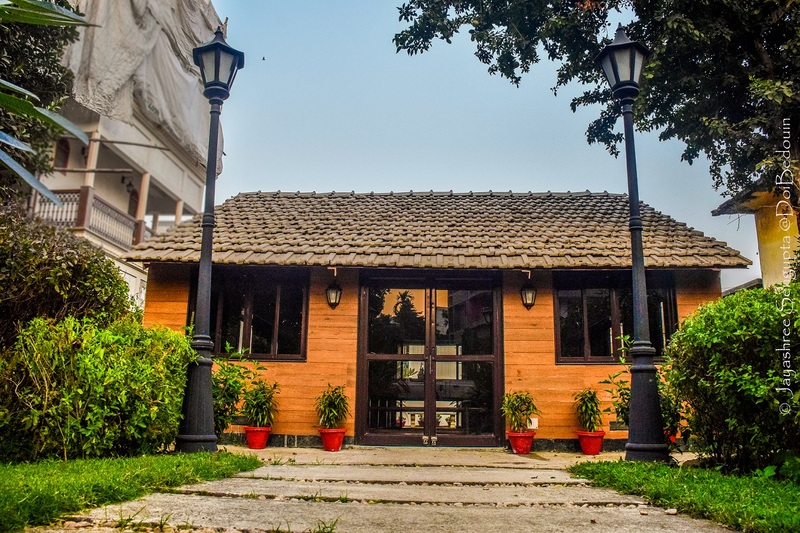 Undoubtedly a perfect location for a homestay with all bare necessities in your grip. The railway station of Belur Math and Belur are easily accessible with the road connection just by the property. State Bank of India is situated at the main road turning, so one would be financially connected too. 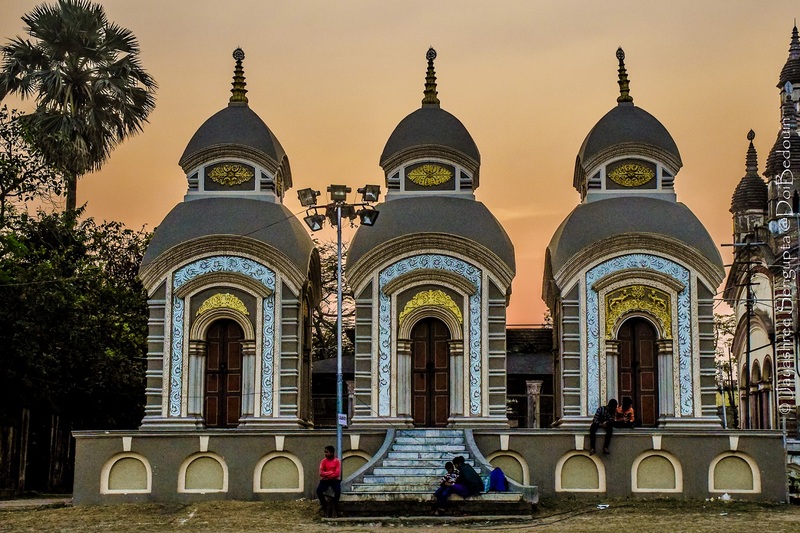 Heritage sites of Belur Math and Dakshineswar is at stones throw from the Rashbari. And the Rashbari itself lights up during Ras, Janmastami and now Holi as well. The craving of the ramblers is thus met with an all-in-all package to enjoy Nature’s bliss as well as the city life with a touch of serenity, given the Ganges’ presence. 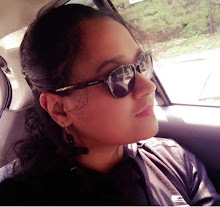 For me it was cherishing and revisiting childhood memories with my father. And with the homestay in motion it would be raising the tourism mercury of the area. Janmastami, (August) celebrating the birth of Krishna. Ras, (November) when there is a week long fair outside the campus. One might contact through their Facebook page for booking. AirBnB link would be updated soon. Really enjoyed the post! I have been to Belur Mat and Dakshineswar. Would absolutely love to stay here once it is accessible to the public the next time I visit with the family. Looks so beautiful! The homestay is started with few rooms for the time being and the renovation still going on. 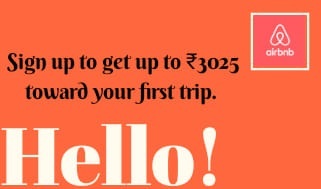 But I would recommend a stay in the upcoming Holi or even Janmastami. What a beautiful place! The architecture and details are so elegant. Holi would be a great time to visit! Hi, I am a member of the Daw family, wife of Atanu Daw. I would like to compliment you for writing this beautiful article covering almost all the important aspect of the Rashbari. And special thanks to the photos which have been posted which is so appealing in sync with the beautiful place. The photos deserves special credit. That architecture is just mind-blowing and the pictures do it great justice. It's lovely to stay in a historic and cultural building. I love reading about India because the architecture amazes me and I love all the bright colors. This looks like an amazing place with a vibrant energy!! This place looks absolutely amazing. Your post really captures the beauty through your photos! I've never heard of these festivals before but they sound wonderful, too! This place is amazing - from the history to the private bathing ghat, I would want to experience it all! I'd love to stay here should I ever get to visit India! I like the fact that it has a private garden and ghats by the Ganges. It must be beautiful at sunset.